If you were to form a supergroup of the most underrated, hard working musicians in punk rock you’d be hard pressed to do better than Medictation. In 2013, Dickie Hammond and Graeme Philliskirk (of Sunderlands legendary Leatherface) joined Hugo Mudie, Fred Jaques and Julien Blais (all of Montreal, Canada’s The Sainte Catherine’s) and proceeded to write Warm Places. Originally planned for release last year, the passing of punk rock veteran Dickie Hammond meant that the record is only now seeing the light of day. While there’s no getting away from the tragedy that this record holds his last work I feel it’s also worth noting that Warm Places is a trans-atlantic collaboration between friends who have toured and played together in years gone by. Opening track “Memories of Youth” gets us introduced to the Medictation sound, drum kicks lead swiftly followed by discordant guitar riffing and Hugo’s rasping vocals form a dynamic that is instantly recognisable yet each song holds it’s own. Fans of Leatherface will recognise Dickie’s distinct playing and it works well with the rest of this band. Throughout the album the melodies and riffs are abundant but it also swings and changes. “Fishing” shakes with punk energy, easing into “The Last Rainfall” with it’s Springsteen influence which shouldn’t surprise considering Hugo and Fred’s side project Miracles. “Saptor Raptor” brings a crowd pleasing festival anthem that blast beats us into a singalong chorus of “on and on and on, we are not alone.” “Paranoid” builds and chugs and really showcases Hugo’s voice. Imagine the gravel in Chuck Ragan warmed in the sun a little and I mean that as a compliment. Only on closing track “Stalingrad” does he pass the mic to Dickie for a massively personal Johnny Cash moment. 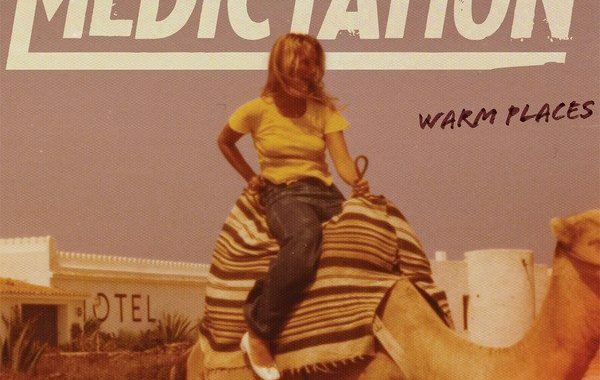 Warm Places concludes a veteran punks career but, while theree may be moments of melancholia, along with the release there are Canadian tour dates for Medictation. It should be said that there isn’t anything genre-bending or overly ground-breaking with this record (other than the minor fact that band members lived 5000km apart) but that is part of what sticks it to me. Sure to please fans of Millencolin, Hot Water Music, The Menzingers, Strung Out, Bad Religion, Samiam, Against Me!, you get the picture. This is Medictation’s first and only record but as individual musicians they’ve been playing punk since before many of today’s scene were born and their unfaltering passion for this timeless, ageless music shines. Posted in Record Reviews, Reviews and tagged leatherface, Little Rocket Records, Medictation.